In 2006 Cementation was awarded the Resolution Project in Arizona, which is operated by Resolution Copper Mining LLC and owned by BHP Billiton and the Rio Tinto Group. The project included the rehabilitation and additional development of the existing Neversweat Tunnel that accesses the shafts approximately 1000 ft below surface. It also involved the sinking of a 28 ft diameter, concrete-lined shaft to a depth of 7000 ft below surface. This shaft was completed and is the deepest single lift shaft in the USA. 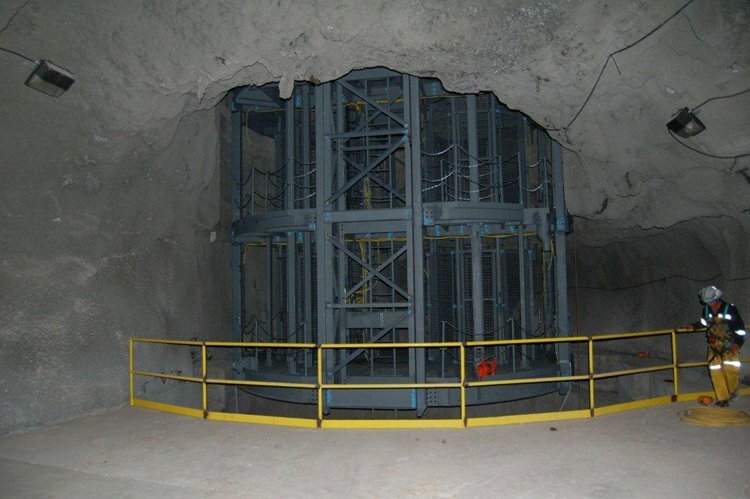 At depth, rock temperatures were in the order of 175 degrees F. The permanent liner for the main shaft is a traditional concrete lining; however, the temporary lining during sinking is by shotcrete. Shotcreting of the shaft walls has been incorporated into the sinking cycle and has provided an excellent means of ground control during shaft sinking. A recent contract award is the rehabilitation of the existing No. 9 Shaft, which is being refurbished and dewatered and will be extended as part of the mine’s permanent ventilation system.